The apartment is situated in a quiet location by the sea at La Playa, which is one of the villages which make up Valle Gran Rey. It is located within a thoughtfully designed small complex in the midst of an attractive garden. It has 2 private terraces, facing either the sea or the swimming pool, which has a children's enclosure, free sun loungers and parasols. There is a small supermarket - which opens 8am - 10pm seven days per week - opposite the apartment, there are several restaurants nearby and the bus stop and nearest bank are 5 minutes walk away. Being so centrally located, a car is not a necessity. Apart from what is probably the best beach on the island, there are several other beaches at walking distance, including a naturist beach. There are many excellent restaurants scattered around Valle Gran Rey, catering for every taste and offering very good value for money. We are a couple who appreciate the quietness and beauty of nature and also enjoy the company of other like-minded people over a nice meal and a glass of wine. 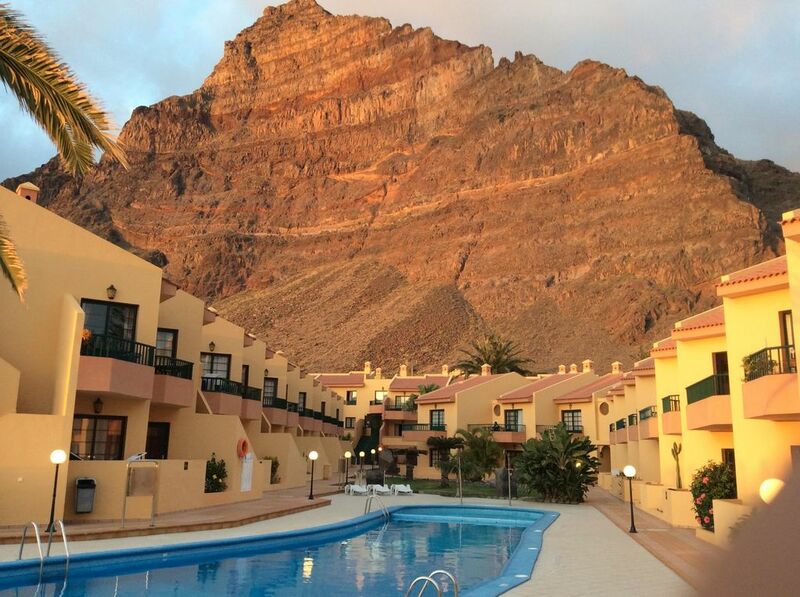 We find all that on La Gomera, and specifically in Valle Gran Rey, as it generally attracts people who are appreciative of nature and like to explore the island by car, local transport or on foot. Dutch friends had visited La Gomera the previous year and as they were so enthusiastic about this island, we tried it out for ourselves in March 2002 and fell in love, especially with the layed-back atmosphere of Valle Gran Rey. We returned in May of the same year and bought the apartment because of its proximity next to the sea, and its setting within a garden. Being complete enclosed, the sounds we can hear is the sea, the birds and sometimes children having fun in the pool. Nevertheless, the apartment is 5 mins walk from two beaches and a small boulevard from where you have a view of the small bay whilst you're enjoying your lunch, dinner or just a coffee or ice-cream - with a group playing local music most evenings. The supermarket and bakery are also located a few mins. away. As walkers, we appreciate the bus station which is located nearby, with busses taking us to and from our walks destinations. And last but not least, as a sun lover I have the choice of two terraces, one of which gets the sun in the morning and one in afternoon/early evening. The same does apply for those who like sitting in a shady spot too of course! Bathroom with bath/shower over, wc, bidet and hairdryer. Outside: There are 2 private terraces with chairs, tables and plants and an additional small garden at the back. The shared swimming pool has sun loungers and parasols. A parasol is left in the apartment for use on the beach. Cleaning / Towels / Linen / Maid service: Bath towels, sheets and linen are provided but you will have to take your own beach towel. The apartment is cleaned once per week, which includes a change of bedlinen. Other: Light and airy bedroom with 2 single beds and fitted wardrobes. Fantastic area for hiking and exploring and the n chilling on the beach. Wonderful to relax in the lovely appartment- can't go wrong!! The description of the property was accurate and clean and Christine was very helpful in her quick replies to inquiries. It has the advantage of a front balcony overlooking the pool and a rear one from where the sea can be seen - sun or shade throughout the day. Wifi is really only accessible from the main reception area. I could recommend this property with complete confidence to others. Valle Gran Rey appeared to be the best and busiest resort on the island. La Playa (where the apartment is situated) has a good beach, especially if you like to swim in the sea and very good restaurants within walking distance - Colorado was our favourite. Within 15-20 mins walk along the promenade is Vueltas with a lovely, calm, beach and swimming area and equally good restaurants (among our favourites was Restaurante Esperato, directly opposite the beach). The information re walks and about the island in general is very helpful and the walks are well sign-posted. We hired a car from Tenerife airport but many people travel by the local buses/taxis. The roads are very winding but not really a problem and we visited all the main towns and sights on the island. We were surprised how cheap the restaurants and bars were compared to Tenerife, for example. La Gomera is a very different Canary Island and we loved it! We booked after doing a lot of research and deciding that La Gomera looked like the Canary Island that was best suited to us - and we weren't wrong! The apartment is perfectly located being only a 2 minute walk from lots of nice bars and restaurants and two beaches. We weren't in the pool as unfortunately we had a bit 'patchy' weather but it looked very nice and was never too busy. The apartment itself was well equipped and had everything we needed. Christine was great pre our holiday supplying us with all the details we needed and answering any questions we had. Valle Gran Rey was a perfect resort for us. It's very laid back and chilled out, indeed around 6pm every night it seemed that the village headed towards the beach wall, drank a few beers and enjoyed the fantastic sunsets. We enjoyed the very relaxed pace of life that Valle Gran Rey offers. We hired a car to get to Valle Gran Rey which was great, however the roads are a little challenging and we arrived on a dark and misty night so if you're not a confident driver perhaps a taxi or the bus would be a better option. All in all a great holiday and we'll definitely be back. JUST SPENT A WEEK AT THIS LOVELY APARTMENT. GREAT CONMUNICATION FROM THE OWNER WHO IS HAPPY TO SUPPLY ANY INFORMATION REQUIRED BEFORE YOUR VISIT. DESCRIPTION IS EXACTLY AS STATED WITH NO HIDDEN SURPRISES. IDEAL FOR A COUPLE OR EVEN FAMILY WITH SMALL CHILDREN. ENJOYED RELAXING ON EITHER BALCONY OF WHICH THERE IS ALWAYS SUN OR SHADE WHICH EVER YOU PREFER AND LISTENING TO THE WAVES FROM THE SEA. A NICE COMLEX WITH PLENTY OF SUN BEDS TO GO ROUND AND A GOOD SIZE POOL. JUST A SHORT WALK INTO TOWN WITH LOVELY RESTURANTS AND RIGHT NEAR A NUMBER OF BEACHES. LA GOMERA IS JUST SO BEAUTIFUL AND JUST SO DIFFERENT FROM THE OVER COMMERCIAL TENERIFE. CANT WAIT TO GO BACK AND WOULD NOT ESITATE TO STAY IN THE APARTMENT AGAIN. walk away at Playa del Ingles. A small boulevard with terraces overlooking the sea and main beach is just a few minutes walk away. There is a small airport on La Gomera (18-seater internal flights only), but most people fly to Tenerife South. A 20 minute bus or 10 minute taxi ride will take you to the port at Los Christianos from where two ferry companies sail for La Gomera, one of them direct to Valle Gran Rey. *service temp. suspended Although a car is not a necessity, car hire is widely available in Valle Gran Rey for one or more days. Further information about flights, ferry and bus times etc. are available on request. La Gomera has a very good local bus service and most places of interest can be visited using this service. Most walkers will use buses for transport to and from walks. Private taxis or share taxis are another option. La Gomera is one of the smaller Canary Islands, situated off the African coast. This island would appeal most to those who prefer a relaxed, easy going holiday. La Gomera is less commercialised than some of the islands and you won't find any massive high rise buildings here. What you will find are deep ravines and valleys that cover most of the island, criss-crossed by ancient mountain paths that make La Gomera a paradise for walkers and nature lovers alike. In the centre of the island is the Garajonay National Park, which is a UNESCO World Heritage site, a unique environment for anyone interested in nature. The weather is warm and sunny all year round and the temperature rarely drops below 18 degrees during daytime, although in the mountains and the rain forest the environment can be moist and temperatures lower than in the coastal areas. The weather in the mountains can be changeable, therefore we recommend walkers to take appropriate clothing, especially during the winter months. Apart from walking, La Gomera offers many activities for the adventurous such as fishing, scuba diving, mountain biking, kayaking, guided walking and botanical tours. There are also regular boat trips around the island to watch the whales and dolphins, and there are plenty of opportunities to indulge yourself in a massage, or join a yoga or meditation group. And if you don't want to exert yourself, you can always just relax on the terrace, by the pool or on the beach. Valle Gran Rey is situated on the West coast of the island and is made up out of several small settlements, and has a very relaxed atmosphere. It has many attractive walks in the immediate area and there is a regular bus and ferry service that will take you to the starting point of many other walks around the island. And last but not least, there are many excellent restaurants scattered around Valle Gran Rey, catering for every taste and offering very good value for money. Booking Notes: When you decide that you would like to stay, please contact us to check availability. We will then hold these dates for you (usually for one week) whilst you arrange your flights. Once your flights are booked, a deposit of 25% (non-returnable) of the total cost is required to confirm your reservation. The balance is due 8 weeks before departure, or at the time of booking if your departure date is less than 8 weeks away. We will then forward key, directions and details of our local caretaker. Changeover Day: Minimum stay is 6 days with flexible changeover day, no maximum stay limit. Arrival time is flexible, departure before 12 noon.